Blocking TGF-β signaling transiently increases the homing and function of adoptively transferred prostate antigen specific CD8 effector T cells in a mouse model of prostate cancer. 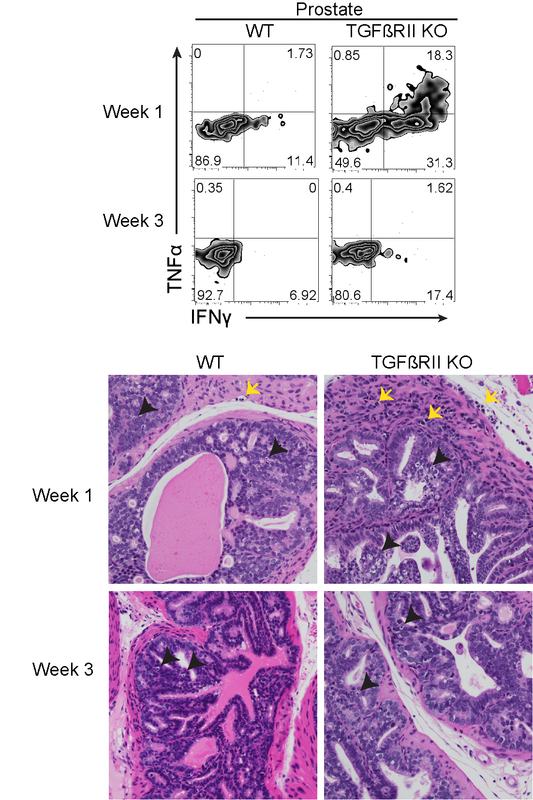 At week 1 post transfer, there is increased effector function of adoptively transferred prostate-infiltrating TGF-βRII knockout (KO) compared to wild-type (WT) CD8 T cells as detected by ex vivo cytokine production, but this dissipates by week 3 (top panel). Hematoxylin and eosin staining of prostates from TRAMPOVA mice at week 1 and week 3 following adoptive transfer of CD8 T cells WT or knockout mice. Black arrowheads point to apoptotic cells and yellow arrows point to lymphoid cells at 20x magnification (bottom panel). Cancer immunotherapy harnesses the power of the immune system to target and kill tumor cells. One such strategy is adoptive T cell therapy (ACT), which involves generating or isolating antitumor cytolytic CD8 T cells from cancer patients, expanding these T cells ex vivo, and then transferring these tumor-reactive T cells back into patients to eradicate tumors. ACT has shown some success in clinical trials against tumors, most notably in metastatic melanoma. However, the lack of persistence and the failure to maintain in vivo antitumor activity are frequent problems. The tumor microenvironment itself is immunosuppressive, recruiting inhibitory cells or secreting inhibitory molecules that block immune cell function. To improve ACT efficacy, T cells can be genetically engineered prior to adoptive transfer to improve effector function by enhancing recognition of tumor cells or abrogating negative signals from the microenvironment. The identification of antigens that T cells can recognize in normal prostate and tumor tissue, but not other tissues, makes prostate cancer amenable to ACT treatment. However, the immunosuppressive prostate microenvironment can limit the efficacy of ACT. The cytokine tumor growth factor β (TGF-β) plays important roles in normal prostate homeostasis. TGF-β expression levels are increased in prostate tumor cells, where it can either promote or inhibit tumor growth depending on the cell context. TGF-β is also immunosuppressive, decreasing proliferation and activity of CD8 T cells. In a recently published study in the Journal of Immunology, graduate student Cassie Chou and members of Dr. Phil Greenberg’s laboratory (Clinical Research Division and University of Washington Department of Immunology) tested the hypothesis that blocking TGF-β signaling would improve the efficacy of ACT against a mouse model of prostate cancer. Previous studies demonstrated that inhibition of TGF-β signaling improved ACT using transplantable prostate tumor models. However, these tumors do not develop in the appropriate microenvironments and the mice mount immune responses before the tumor forms. Therefore to more faithfully replicate human disease, Cassie Chou and colleagues used a mouse model of prostate cancer in which the tumor arises spontaneously through the expression of an oncogene, in this case SV40 T antigen, to form a transgenic adenocarcinoma of the mouse prostate (TRAMP mice). These mice were also engineered to express a T-cell-targetable antigen, OVA, specifically in the prostate (TRAMPOVA mice). For adoptive transfer, CD8 T cells were isolated from a different mouse engineered with a T cell receptor that recognizes the OVA antigen. These cells were compared to OVA-specific CD8 T cells engineered to lack TGF-β signaling by knocking out expression of the TGF-β receptor II (TGF-βRII KO). Both types of T cells were transferred into tumor bearing TRAMPOVA mice. Chou et al. found a significantly increased accumulation of TGF-βRII KO versus wildtype CD8 T cells in the spleen, prostate draining lymph node (PDN), and the prostate one week after transfer into TRAMPOVA mice (p<0.01). This accumulation was less pronounced in TRAMP mice without OVA antigen, suggesting TGF-βRII KO T cell expansion was antigen specific. Furthermore, the TGF-βRII KO T cells were more proliferative and had decreased apoptotic proteins compared to control cells with intact TGF-β signaling. The activity of these T cells was assayed one week after transfer, by measuring production of the cytotoxic cytokines interferon γ (IFN-γ) and tumor necrosis factor α (TNF-α) in response to OVA antigen ex vivo (see Figure). Abrogation of TGF-β signaling increased activity of T cells harvested from the prostate and PDN, but this activity was lower than that observed in cells from the spleen (p=0.0018), suggesting additional immunosuppressive effects in the prostate. However, at this same time point, the prostate tumors displayed more T cell infiltration and more tumor destruction if the transferred T cells lacked TGF-βRII, as evidenced by analysis of prostate tumors at one week post transfer (see Figure). The increased effector function and antitumor activity of TGF-βRII KO T cells compared to wildtype T cells was not sustained past three weeks in the prostate, but was maintained in the spleen and PDN. This suggested that additional TGF-β-independent, prostate-specific barriers were present that dysregulated the accumulation and function of T cells in the prostate. Future studies to identify and abrogate these specific barriers could significantly improve the efficacy of ACT in treating solid tumors. Currently, pretreatment regimens of irradiation or chemotherapy can improve ACT efficacy by nonspecifically modulating the tumor microenvironment through a variety of mechanisms: the depletion of immunosuppressive cells, such as regulatory T cells and myeloid-derived stem cells; the removal of cells that compete for activating cytokines; and the increase of antigen presenting cells. This might further enhance the activity of TGF-βRII KO T cells with specificity for a tumor antigen. Chou CK, Schietinger A, Liggitt HD, Tan X, Funk S, Freeman GJ, Ratliff TL, Greenberg NM, Greenberg PD. 2012. Cell-Intrinsic Abrogation of TGF-β Signaling Delays but Does Not Prevent Dysfunction of Self/Tumor-Specific CD8 T Cells in a Murine Model of Autochthonous Prostate Cancer. Journal of Immunology. Oct 15;189(8): 3936-46. Also see: Restifo NP, Dudley ME, and Rosenber SA. 2012. Adoptive immunotherapy for cancer: harnessing the T cell response. Nature Reviews Immunology 12, 269-281.